I take my health very seriously after making a major health change about 2 years ago. When I first started meeting with a dietician one of the things that she highly recommended for me to use as part of a low carb/high protein diet was a really good Probiotic. I have looked around for several different ones but the Great Oral Health is by far one of the best. It works great by supporting my digestive health while I maintain a healthy diet and exercise. Great Oral Health promotes regular digestive health as well as great dental health. The probiotic helps to improve digestive health and with Great Oral Health you can also improve your dental health. It is so great to have a supportive product like Great Oral Health while I am trying to maintain my weight loss and stay healthy! 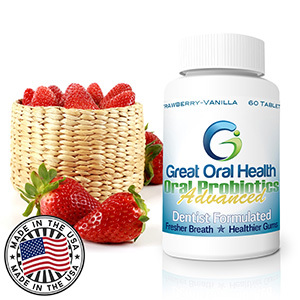 Formulated by one of the top holistic, natural dentists in the country, this advanced blend of powerful oral probiotics works to restore a beneficial biological balance in your mouth and oral zone. The “bad” bacteria in our mouths are prime factors in poor health conditions such as bad breath, tooth decay, gum disease and even ear, throat and nose infections. Our mouths are one of the primary gateways into our bodies and a weakened immune system in that area can greatly contribute to other negative health conditions. Rebuilding a beneficial blend of probiotics in your mouth can lend a real hand in boosting your overall immune system and in reducing gum disease, tooth decay, bad breath and tonsil stones. Plus, for sufferers of dry mouth, these probiotics can greatly restore the natural flow of saliva. Benefits that our users have experienced include fresher breath (almost ALL chronic bad breath is caused by the byproducts of the “bad” bacterial overgrowth in our mouths), fewer colds and throat infections, reduction in gum bleeding and gum infections, reduced plaque and some even reported a whitening of the teeth over time. This formulation has SEVEN powerful probiotic strains, including the patented BLIS K12 and M18. It also includes a blend of zinc and calcium to assist in the remineralization of tooth enamel. The product is completely gluten free, all natural and due to its proprietary manufacturing process does NOT require refrigeration!